Kittens need to explore their environment and test things; here's how to make sure they do it safely. 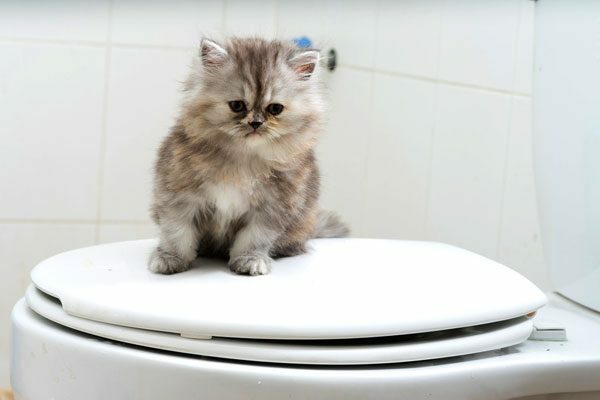 Kittens excel at attempting balancing acts — sometimes choosing precarious places like toilet seats and the edges of bathtubs to practice gymnastics. The little acrobats can lose their balance, fall and not be able to jump out of open commodes. You can help keep them safe (and dry) by diligently putting toilet seat lids down. Bathtubs can be a challenge as well. 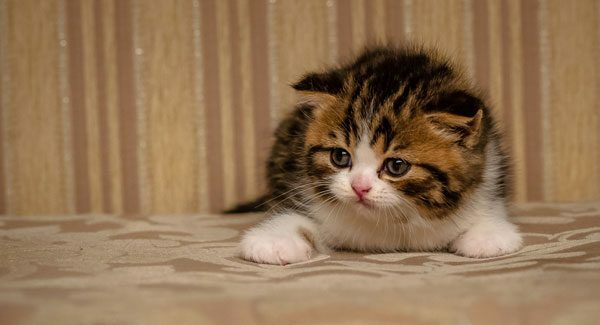 Because they are slippery, it’s difficult, and depending on the individual kitten, impossible for them to climb or jump out. Placing an object to climb on in the tub can help, but it needs to be something that can’t flip over and trap a little one underneath. Also, open the bathtub drains, just in case a precocious kitten bats the water on. The best way to kitten-proof bathrooms is to keep the doors closed until the kittens are older, larger and more coordinated. It doesn’t take much for precious kittens to slip through broken and unsecured window and door screens. Make them inescapable! Check all of the screens in your home; fix the tears and securely fasten them to the frames, so that little paws and heads can’t dislodge them. 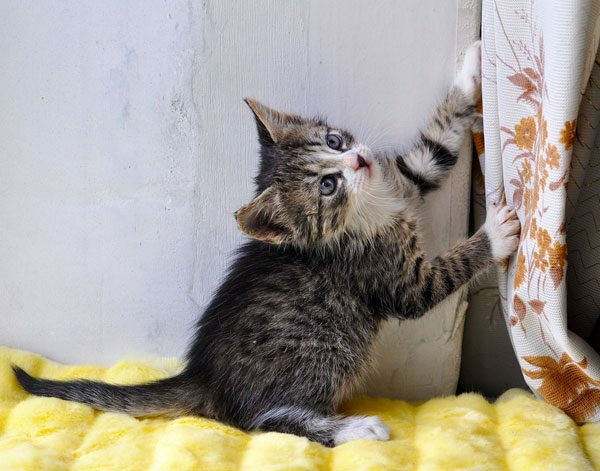 Kittens can’t resist playing with cords, especially hanging pulls and cords that are attached to curtains, shades and shutters. They’re dangerous — kitties can get caught in them and be seriously injured. Secure them out of reach, making sure that they don’t enticingly swing and dangle. 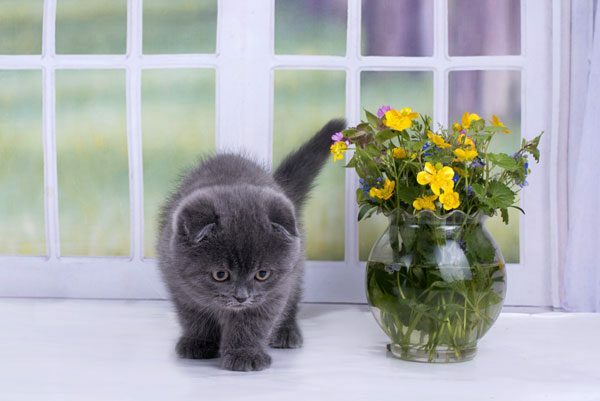 Many products made for child-proofing are perfect for kitten-proofing. Electrical and computer cords can be irresistible to chew and wrestle. Group them together and put them in conduits or cover them with cord protectors. An easy and fast solution is to thread them through PVC pipes. Sadly, furniture, such as rocking chairs, adjustable sofas, recliners and exercise equipment that have movable parts, are dangerous. Vulnerable kittens will venture underneath or climb inside the mechanical parts. Always be on the alert — know where the little ones are before rocking or adjusting furniture. Consider playing it safe and temporarily replacing potentially harmful furniture with safer pieces that don’t have movable parts. Little ones are notorious for exploring and napping in hidden, enclosed places. Some, such as warm dryers and the areas behind drawers aren’t safe. Always check dryers and drawers before closing them and be extra careful — they are tempting to kittens. Cleaning products are toxic! Tighten the caps on the containers so that they can’t spill, and store them in places that are safe from little paws. 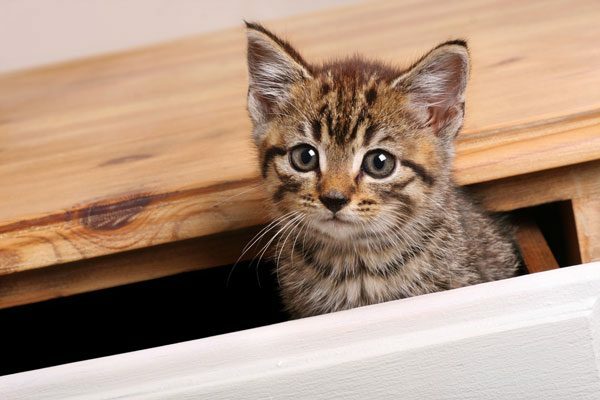 Install child-proof latches on cupboards and in drawers so that precocious kittens can’t reach them. Kittens can’t resist playing with string, yarn and ribbons. Although these items seem harmless, youngsters can become dangerously entangled in them and can swallow the ends. These aren’t cat toys — never leave them where the kittens can access them. 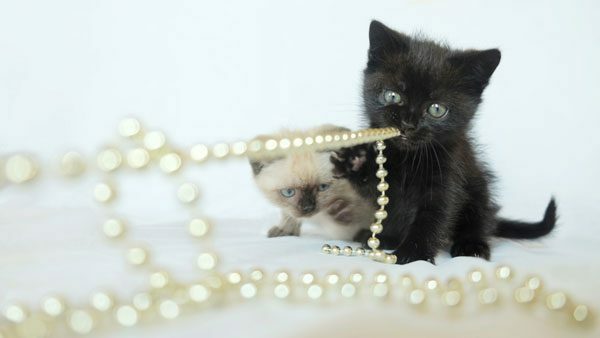 Additionally, jewelry, including necklaces, bracelets and earrings, appeal to the little players and need to be secured in areas where curious paws can’t find them. In many ways, kittens are similar to toddlers. Small objects often end up in mouths. Plastic tops, hair ties, cotton tips and pipe cleaners aren’t playthings — they are easy to chew and swallow. Don’t encourage the little ones to bat and chase them. Be mindful of other stray items such as pills and batteries. They also can be ingested. 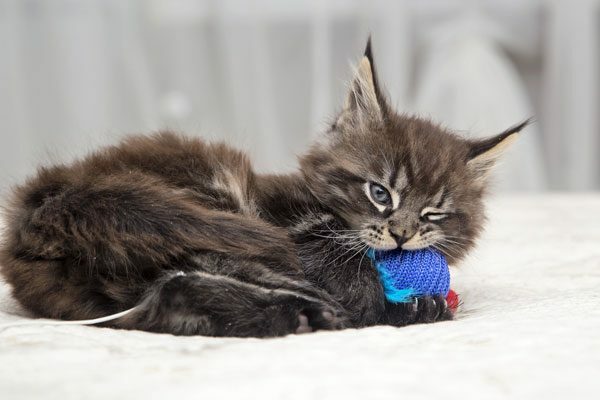 Many cat toys are developed to appeal to buyers instead of the end-users — kittens. Although they may be pretty and cute, some have pieces that sharp little teeth can chew off and swallow. Others may not stand up to the youngsters’ mauling. Check out toys carefully before bringing them home. Choose ones that are durable and without ears, tails, eyes and other parts that can be chewed off and ingested. Nothing is exempt. Everything, including plants, within reach of active kittens has a good chance of being rubbed, batted and chewed. Unfortunately, most household plants are poisonous. These include ones that are potted or dried along with pretty cut flowers and the water they sit in. Although, not all plants are toxic, be cautious and remove plants and flowers from your home. Can you think of other ways to kitten proof homes? Please add them in the comment area below. They will help Catster readers keep precious kittens safe. Please like Marilyn’s Facebook Page! Do you have a cat behavior question for Marilyn? Ask our behaviorist in the comments below and you might be featured in an upcoming column. If you suspect a behavioral problem, always rule out any possible medical issues that may be causing the behavior by first having your cat examined by a veterinarian. Marilyn, a certified cat behavior consultant, owner of The Cat Coach, LLC, solves cat behavior problems nationally and internationally through on site and Skype consultations. She uses positive reinforcement, including environmental changes, clicker training and other behavior modification techniques. She is also an award winning author. Her book Naughty No More! focuses on solving cat behavior problems through clicker training and other positive reinforcement methods. Marilyn is big on education — she feels it is important for cat parents to know the reasons behind their cat’s behaviors. Marilyn frequent guests on television and radio, answering cat behavior questions and helping people understand their cats.